Kenneth Gordon Eade is an American environmental activist, author and lawyer, best known for his legal and political thrillers. Eade’s first bestseller on Amazon.com was “An Involuntary Spy,” a fictional spy thriller that critics have said has broken wide open the GMO controversy. The story follows a rogue scientist working for an American biotech firm who goes on the run from authorities after stealing information from his employer which proves government collusion and a cover-up of fraud surrounding the dangers of the company’s genetically engineered foods. All of Eade’s novels involve the fictitious character, Brent Marks and are known as the Brent Marks Legal Thrillers. All of these books are now available on Amazon.com. 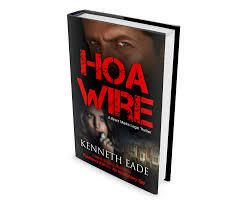 For more information about “HOA Wire” or any of Eade’s other novels, Click here or check out his Facebook page. Synopsis: When a naturalized American citizen turns up missing in Iraq, Brent Marks fights the Goliath US Government’s Patriot Act. Santa Barbara accountant Ahmed Khury responds to the plea of his brother, a suspected money launderer in Iraq. Before Ahmed realizes what has happened, he is sent to Guantanamo Bay Detention Camp as a suspected terrorist, and is tortured to extract information that he doesn’t have. The courtroom drama mounts as the drama outside the courtroom explodes, and when murder, corruption, and cover-up enter the picture, nobody, including Brent, is safe. I am writing to urge you, the winner of the Nobel Peace Prize, not to provide the much talked about military aid to the current government in the Ukraine and provoking World War III. This would be an act of aggression toward Russia and will lead to war in Europe; something that would make even Presidents Reagan and Nixon roll over in their graves. Against the interests and wishes of their constituents, the Congress has already authorized lethal aid to Ukraine. If US soldiers or weaponry are deployed in Ukraine, I have no doubt that Moscow will act swiftly and take Kiev. Then the US will repeat its rhetoric about “aggression” and it will escalate to a war between the two most heavily armed nuclear nations in the world. Everybody with a brain knows this is about money, and that the American populous is too ignorant and uninformed to care. Russia’s geopolitical interests in the Ukraine are very clear and go back centuries; far beyond the Soviet Union. The threat of a Russian invasion and takeover of the Ukraine is ridiculous, but it will be very real if Russia is provoked and has to defend its interests. It would have already happened if it was going to happen, without much fanfare and with little or no resistance. The annexation of the Crimea was a logical result of the Washington backed coup of the Ukrainian government. The Crimea provides the strategic location of a Russian naval base on the Black Sea, established in Sevastopol, a city built by the Russian Empire in 1783, before the penning of the United States Constitution. It is this naval base that is the key to the Russia’s access to the Black Sea. The current base, before the annexation of Crimea to Russia, was under lease from the Ukrainian government to Russia. Unlike Crimea, Russia has no interest in annexing the Ukraine, a relatively poor country, which would only place a burden on Russia’s already heavily burdened social welfare system. The current crisis in the Ukraine, orchestrated by the United States, only benefits the U.S. military industrial machine, U.S. oil and gas barons and the chemical industrial companies. Gas poor Europe, the primary potential customer, has thrown its hat in (as usual) with the United States and joined it in imposing economic sanctions against Russia, which have caused billions of dollars of damage to the Russian economy. These sanctions are tantamount to a declaration of economic war against Russia. The double speak supporting these sanctions is as hypocritical as your Peace Prize. The official reason cited is a response to Russia’s alleged military aggression in the Ukraine. It is no secret that the United States is now at war in Syria, under the guise of fighting ISIS, but the real reason the U.S. in bombing Syria is the same reason that it bombed Iraq into oblivion. The real struggle is over oil and gas and its transmission to Europe in this critical region. Dominance of the area is critical to the U.S. energy barons and the continuing success and profit of the never ending U.S. military hardware and support industry. But to extend its reach into Russia’s rich and vast natural resources by attempting a “regime change” in Russia is the equivalent of playing Russian roulette. Russia is not an aggressive nation. But, sure as Napoleon in the 19th century and Hitler in the 20th discovered, it does not take kindly to invasion, and every man and woman in Russia will join together to defeat any such attempt. It is in their blood. With all the experts on Russia in our government, why haven’t you consulted them on this? It is crazy for the United States to pick a fight with this nation. And to pick a fight with the strongest leader at the helm of the country since Joseph Stalin is even crazier. Despite all the efforts to chip away at Putin’s popularity, he remains popular with the people, and for just reason. Things are much better in Russia under his leadership. I know. I have seen it. Unemployment is down, pension payments are up, corruption is down, and the quality of life is significantly better than it was before. Joe Biden may find European critics to Russian economic sanctions “annoying,” but the people of the United States have to realize that we are not threatened by this peaceful, but very powerful nation which occupies the largest land mass on earth. He has told Putin to “get out of Ukraine,” which seems to be throwing the gauntlet down, while at the same time he has installed his son onto the board of the largest privately owned gas company. At the same time, your administration is considering weaponizing the newly installed government, which has already established a history of ethnic cleansing, with hundreds to billions in military aid. Sitting right on the Russian border is no place to put a NATO presence, but the war hawks do not seem to care, and the people of the U.S. seem oblivious to it. Please de-escalate the military escalation in Europe on Russia’s borders, and do not weaponize Ukraine. You are the only one now standing between peace and war. Please earn your Nobel Peace Prize, Mr. President. There is big a difference between crime and detective novels and courtroom dramas. In one, the action takes place on the streets; and in the other, the main story takes place in the courtroom. HOA Wire represents the latter, and will appeal to fans of Grisham and any other writer who spins a solid yarn based on courtroom drama and realistic experiences. While it’s Book Three in the Brent Marks legal thriller series, newcomers will find it quickly accessible. It revolves around the murder of a homeowner’s association president, where lawyer Brent Marks finds himself standing square in the center of a maelstrom of puzzles in which every town resident is a potential suspect and no easy answers are apparent. Readers aren’t bludgeoned over the head with clues that are obvious leads, and they aren’t teased by the presence of a protagonist who might know the answers, either. Brent Marks is well-educated and trained, but is just as puzzled as readers – and it’s his process of discovery that succeeds in creating an involving story of just how a crime is solved. The obvious prerequisite for enjoying this approach is affection for courtroom dramas, because this is the centerpiece, here. Readers with such an interest will find HOA Wire successfully weaves crime and courtroom to such a degree that the unexpected conclusion comes as both a successful, logical outcome and as a real surprise. With its real insights on HOA processes and neighbor disputes, HOA Wire is a deft exploration of attorney-client ethics on the line, and is crime/courtroom writing at its best.